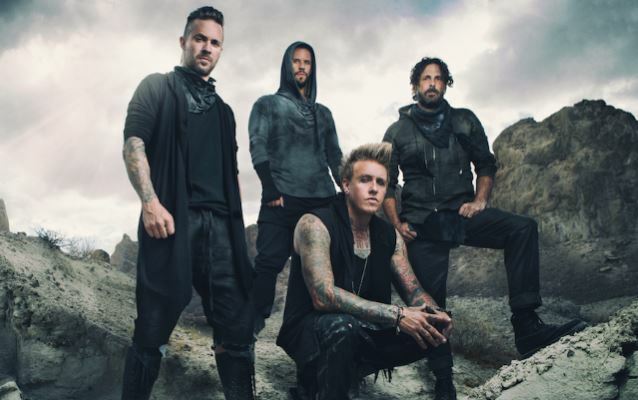 Californian rockers PAPA ROACH will release their eighth studio album "F.E.A.R. ", on January 27, 2015 via Eleven Seven Music. The follow-up to 2012's "The Connection" was recorded at Las Vegas' The Hideout Recording Studio, which is owned and operated by Canadian producer Kevin Churko. Churko has previously worked with OZZY OSBOURNE, FIVE FINGER DEATH PUNCH, IN THIS MOMENT and HELLYEAH. PAPA ROACH guitarist Jerry Horton revealed that the band worked with two producers, Kevin Churko and Kevin's son Kane, saying, "We did the first five songs with Kevin, the dad, and then the last seven with the son, because [Kevin] had a prior engagement with IN THIS MOMENT… It was a different sort of workflow, but we got into it and it was cool. And I think we came out with some really good stuff." PAPA ROACH singer Jacoby Shaddix told Kerrang! magazine that "F.E.A.R." is "probably the most positive record we've written," adding, "There's obviously been an element of hope within the despair of the music that we write, and I think that that's always key, and that's very important to what we do, is to always have that element of hope, and that's laced throughout the record." PAPA ROACH filmed the "Face Everything And Rise" video late last month. Horton described the experience as "tiring, painful, and dry, but totally worth it!" He added: "I can't wait for you to see [it]." Shaddix co-directed the "Face Everything And Rise" video, for which he also came up with the concept. He told DutchScene: "Me and my partner from Luminous Pictures [Ezio Lucido, which] is another endeavor I'm involved in — it's a filmmaking company, but also we do music videos — this will be the first music video that I co-direct." He continued: "It's pretty cool, man, 'cause the band is trusting me to co-direct this music video, which is the first time we've done something like this. And I've been trying to encourage Jerry… Jerry is going to shoot the photography for the album cover. And so, it's, like, we just kind of wanna take everything back into our hands instead of going, 'OK, cool. I wanna hear your interpretation.' Well, no. I wanna visually let you see what's in my heart when I'm creating this music."